In this weeks reading from Parsahat Ki Tavo (Devarim / Deuteronomy 26:1-29:8), Moshe tells us that the Lord has brought His people out of Egypt with a mighty hand and an outstretched arm; with great terror, signs, and wonders He delivered His people. We are told disobedience to the commandments is punishable since failing to observe the commands is synonymous to breaking the covenant. This poses a problem by reason that we all fall short of the Torah command and have at one time or another been disobedient. (Note that disobeying either the greater or the lesser, constitutes disobedience to them all. – James 2:10) This dilemma is further delineated in the moral imperatives found within the “aseret ha’dvarim” (עֲשֶׂרֶת הַדְּבָרִים) where nine of the Ten Commandments are repeated in the New Testament, but the commandment regarding the Sabbath is notably absent. Does the New Covenant promote disobedience to the command of the Sabbath day? Some would say yes! This presents a significant problem when Scripture explicitly states that God never changes (see Bamidbar / Numbers 23:19, Malachi 3:6, Hebrews 13:8, and James 1:17). Studying the culture and the rabbinic understanding of the Sabbath, much of the New Testament narratives and discussion may be resolved.. For example, Yeshua is described as pointing out to the religious leaders their misunderstanding of the Torah by making observance of the Sabbath more rigorous than God had commanded. For example, it is not unlawful to eat on the Sabbath, even if food must be obtained by plucking grain from the ears. It is also not unlawful to do good on the Sabbath since healing is a work of mercy, and Yeshua, who stated that He is Lord of the Sabbath was merciful. The Pharisaical criticisms concerning the Shabbat are unjustified. In this week’s portion we are reminded that God delivered Israel with a mighty hand and an out stretched arm. What is the weight of Devarim / Deuteronomy 26:8 in light of the context of Jeremiah 31 when one day the Lord will make a new covenant with His people in a way that is different from Israel’s deliverance from Egypt? Is this a significant departure from the way in which God has revealed Himself previously in the Torah? The only place where the phrase בְּרִית חֲדָשָׁה “new covenant” is used in the Tanach is found in Jeremiah 31:31. What is the significance of this fact and does the description of a new covenant in Jeremiah 31:31 provide us with an expectation that God is going to do something different in the future? Let’s read through Jeremiah 31:30-34. Jeremiah’s Prophetic statements come on the heals of having said that each man will die for his own iniquity. In the book of Jeremiah, he repeatedly uses the phrase “yomim bayim” (יָמִים בָּאִים) “the days are coming” to describe future events. Fourteen times he warns Israel of their impending punishment if they do not turn from their evil ways (Jeremiah 7:32, 9:24, 19:16), four times he warns the nations for their oppression of Israel (Jeremiah 48:12, 49:2, 51:47, 51:52), six times he speaks of the promises to return Israel from exile (Jeremiah 16:14, 23:5, 23:7, 30:3, 31:27, 33:14), and once, here, he speaks of a new covenant. Can you see how merciful the Lord is warning his people fourteen times and the nations only four times? Jeremiah says that this new covenant will not be like the covenant which the Lord made with their fathers in the day He took them by the hand to bring them out of Egypt. Notice how different this is as compared to Devarim / Deuteronomy 26:8 where the Lord brought His people out of Egypt with a mighty hand and an outstretched arm; with great terror, signs, and wonders. The new covenant is unique to this passage in Jeremiah and if we read further in Jeremiah, he speaks of an everlasting covenant which will never be forgotten (בְּרִית עוֹלָם לֹא תִשָּׁכֵחַ) in Jeremiah 50:5. In the prophecy of the future time in Jeremiah 31, the Lord speaks of placing his Torah in the hearts of His people and that the uniqueness of doing so will result in “we being His people and He being our God.” Jeremiah speaks of the significance of the words of the Torah and the one who lays them up in his heart. In addition to this, Jeremiah says that in this day 31:34 ‘They will not teach again, each man his neighbor and each man his brother, saying, ‘Know the Lord,’ for they will all know Me, from the least of them to the greatest of them,’ declares the Lord, ‘for I will forgive their iniquity, and their sin I will remember no more.’ (NASB) The question is, today, in the Messiah Yeshua, God writes His Torah on our hearts and changes us from the inside, He gives us circumcised hearts. But here we find Jeremiah saying that in this day no man will need to teach his brother to know the Lord. This seems strange because today we still need teachers, preachers, ministers, and rabbis. Is this prophecy providing us with an expectation of the World to come? It certainly seems so to me. This may be the way the Messiah and the Olam Habah are drawn together prophetically into the context of individual salvation, redemption, and relationship with our Father in heaven with a expectant hope of seeing Him face to face in the World to come. 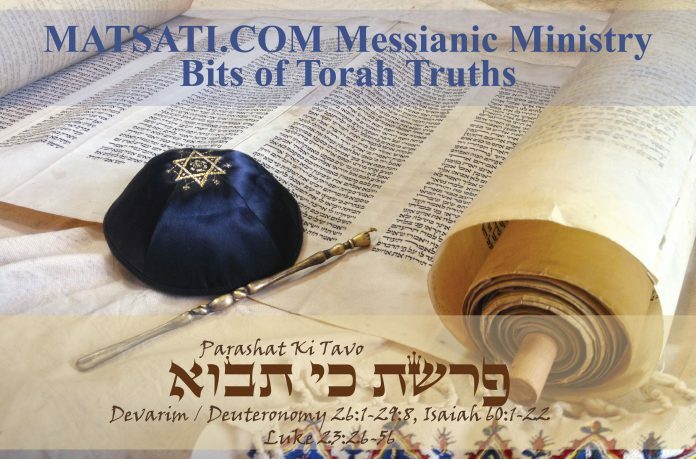 In this week’s reading from Midrash Rabbah Devarim on Parashat Ki Tavo we find the rabbis also speaking of the significance of the words of the Torah according to Midrash Rabbah Devarim, Parashat 7, Part 9 (מדרש רבה דברים פרשה ז סימן ט). Another explanation, If you will receive my words. R. Judah son of Shalom said, God said to Israel, When are you called My children? When you receive My Words. This can be compared to a kin to whom his son said, Set some mark upon me in the land that people should know that I am your son. Whereupon the king replied, If you wish that all should know that you are my son, then put on my purple cloak and place my crown on your head, and all will know that you are my son. So God said to Israel, If you wish to be distinguished as My children, then occupy yourselves with the study of the Torah and with the precepts, and all will see that you are My Children. So, when are you My Children? When you receive My words. Rabbi said, When Israel were in the wilderness, a pillar of cloud journeyed in front of them, and the smoke of the altar and the smoke of the incense went up towards heaven, and two sparks of fire issued from between the two staves of the Ark and devoured in front of them the serpents and scorpions; and when the nations of the world saw them they exclaimed, These are divine beings, for whatever they do is with fire. Thereupon Moshe said to Israel, All the distinction which God caused to be lavished upon you is only because you have accepted His Torah at Sinai. Hence, the force of, An Moshe called unto all Israel, and said unto them, etc (Devarim / Deuteronomy 5:1). He said unto them, know that all the miracles which God wrought for you, you have witness them with your own eyes. In Egypt He wrought miracles for you and your eyes saw it. Whence is this? For it is said, The great trials (ha-massot) which your eyes saw (Devarim / Deuteronomy 29:2). What is the force of ha-massot? It implies that the plagues weakened (me-massot) the bodies of the Egyptians. What is the meaning of the signs? The Rabbis said, The plagues became engraven on their bodies. For example, the words Dam (blood), Zefardea (Frog), Kinnim (Vermin). What is the meaning of And the wonders? The plagues deceived them. How? The plagues came every thirty days and lasted for seven days and then departed. The Egyptians had thus respite for twenty-three days between one plague and the next. Thus proves that the plagues deceived them. The rabbis speak of a man who asks the Lord to set His mark upon him so that people would know that he belongs to the Lord. The mark draws in the context of Cain and Abel and the mark that God placed on Cain after having killed his brother, the mark was designed to prevent Cain from being killed by others when they see him. Everyone would know who he was based upon the mark that God placed upon him. In a similar parallel, the mark referred to by the rabbis is to walk in God’s ways according to the Torah as the midrash describes in the king’s response. Whereupon the king replied, If you wish that all should know that you are my son, then put on my purple cloak and place my crown on your head, and all will know that you are my son. So God said to Israel, If you wish to be distinguished as My children, then occupy yourselves with the study of the Torah and with the precepts, and all will see that you are My Children. In Midrash Rabbah Devarim, we are told that God will place His glory upon us that is indicated by our taking on the king’s robe and his crown. This is accomplished by making known to all men who we are by taking upon ourselves God’s ways which is to be merciful as He is merciful, to have grace towards others as He has grace towards us, and to love one another as God has loved us. Does this sound similar to what Yeshua is teaching in John 13:35 “By this all men will know that you are My disciples, if you have love for one another” (NASB)? Isn’t this clearly a Torah principle? The rabbis contrast the one who seeks the Lord and occupies himself with the study of the Torah to the unrighteous who bring upon themselves plagues and are deceived because they do not believe in the Word of the Lord. In Midrash Rabbah like we see in Midrash Tehillim, we find a core hermeneutic principle that is utilized frequently in the rabbinic literature. This principle consists of phrases such as “these words are to be considered in the light of what Scripture says elsewhere,” or “what is the force of these words,” etc. The rabbis state here in Midrash Rabbah Devarim, “Hence, the force of, An Moshe called unto all Israel, and said unto them, etc (Devarim / Deuteronomy 5:1)” drawing us to consider the importance of Moshe’s words. The idea is to get the “Strength,” “Force,” or “Importance” of a particular phrase or word. This hermeneutic principle places a high priority on God’s word. How often do we look at a particular scripture, phrase, or word and base our understanding upon personal opinion rather than placing a priority on the word of God to help in the interpretation of the meaning? The rabbis ask what is the force of Moshe’s words in his calling out to Israel in Devarim / Deuteronomy 5:1. This draws us into the Torah context providing us with a picture of the grammato-logical world of the rabbis, to seek to understand truth and righteousness by way of God’s Word. Considering the Torah portion, the prophecy of Jeremiah, and Midrash Rabba Devarim, the New Covenant will be unique in the sense that the Torah will govern the life and emotions of God’s people because it is written upon their hearts. In Jeremiah 31:33 the Lord says לב כִּי זֹאת הַבְּרִית אֲשֶׁר אֶכְרֹת אֶת-בֵּית יִשְֹרָאֵל אַחֲרֵי הַיָּמִים הָהֵם נְאֻם-יְהֹוָה נָתַתִּי אֶת-תּוֹרָתִי בְּקִרְבָּם וְעַל-לִבָּם אֶכְתֲּבֶנָּה וְהָיִיתִי לָהֶם לֵאלֹהִים וְהֵמָּה יִהְיוּ-לִי לְעָם: 31:33 ‘But this is the covenant which I will make with the house of Israel after those days,’ declares the Lord, ‘I will put My law within them and on their heart I will write it; and I will be their God, and they shall be My people. (NASB) Here “My Law/Torah” (תּוֹרָתִי) represents the total content of God’s revealed will and purpose for His people that is contained in the New Covenant that He is making. Just as it says in this week’s Torah portion from Devarim / Deuteronomy 26:16 “This day the Lord your God commands you to do these statutes and rules. You shall therefore be careful to do them with all your heart and with all your soul. (NASB) Obedience to the command is to be heart felt and come from the deepest regions of a man, from his very soul. This couldn’t be accomplished if it was not by the power of God and His Holy Spirit dwelling in our hearts. The Law written upon the heart is what brings true happiness and a transformed life. The “significance,” “Strength,” “Force,” or “Importance” of the Torah is that these are the ways we who are called by His name are to live, which is revealed by the prophetic revelations of the Scriptures like what we find here in Jeremiah 31. Based upon this understanding of the Scriptures, the New Covenant is not a departure from the way God has revealed Himself previously in the Torah. This is a continuation of the character of God who works throughout history to draw men to Himself because of the great love that He has for us.